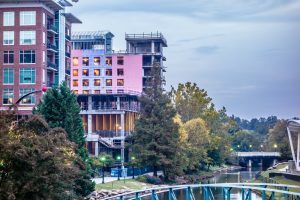 In Downtown Greenville, Clean Businesses Thrive. Cleanliness is vital in all aspects of life; be it at our homes, places of work or schools. Cleanliness is necessary for good health and tidiness. At summit janitorial we clearly understand the need for the community of Greenville to have professional cleaning services. Downtown Greenville is a place that has put great value in the cleanliness of the town in all areas. No one loves to be in a town that is dirty and messy; therefore, Greenville is a nice residential and economic place. Here are some reasons why a clean workplace makes a city clean and why they thrive as opposed to dirty workplaces. Hiring professionals to clean your work place as opposed to having in-house cleaning is the best way to go for many obvious reasons. The first reason is that professional cleaners like summit have had years of experience and they are familiar with all cleaning procedures that will leave your business spotless and germs-free. Germ free workplaces means there are healthier employees who are not constantly missing work due to sick leaves. Healthy employees are very productive and it is for this reason why Greenville is a thriving economic hub. Clean businesses also thrive because the employees are able to concentrate on their work as opposed to constantly trying to organize their stations and clean them up. Hiring professionals like most Greenville Businesses do, will take the cleaning time off your employees’ hands and allow them to focus on developing the company. Tidy and organized work stations also give the employees morale to work and be productive. At Summit Janitorial, we have long been the trusted professional in Greenville since 1994 and it is for this reason that Greenville stands out as a clean city. When your workplaces are clean, this reflects on the city because these standards are carried by the employees and the clients too. It is not possible for a person to have a clean office and litter the city. The mindset is maintained all through the city as well. We at Summit have set the bar so high that it is virtually impossible to go back. Another reason why we have enabled Greenville to be a thriving place for businesses and keep the cities clean is because we have long kept the facilities that hire us clean and well-maintained and in perfectly good condition. When you walk around, you will not see dirt stained glass window and doors. Such facilities will always look bright and appear new every time because we do take our work very seriously. Clean businesses also attract a lot of clients. First impressions are very important and a dirty workplace will immediately repel the customers. At Summit Janitorial, we have long kept even the medical facilities spotless. Greenville hospitals have a reputation of being well maintained. When cleaning, we do not leave and spot untouched and that is why we have long been trusted by the city to keep it clean. We are a reliable cleaning company and we have joined the Greenville County collaboration and become a cleaning company that brings jobs to the economic health of Greenville County. We have found a way to bring health back to our local economy. We also save Greenville companies a lot of money that would have otherwise been used to outsource services outside the county.